RUSH: How many of you are aware that Barack Hussein O was in Boston over the weekend and made a private speech, an off-the-record speech? Did you hear about this? MIT’s Sloan Sports Analytics Conference invited Obama to come make a speech, reflections on his presidency and thoughts on other things. And the command went out that Obama’s speech was to be off-the-record, that nobody but nobody was to record it. Nobody but nobody was to report it! Even though they invited journalists in there, nobody was supposed to leak it. Nobody was supposed to say a word about what Obama said. They’ve perfected it into a marketing work of art. Same thing here. “Yeah, we got Obama in there, but you can’t tell anybody what he said.” “Why not?” (stammering) “Well, he — he — he wouldn’t come, ’cause he’s gonna say stuff in there that he would never otherwise say to anybody else. He doesn’t want it known.” You really expect us to believe this? 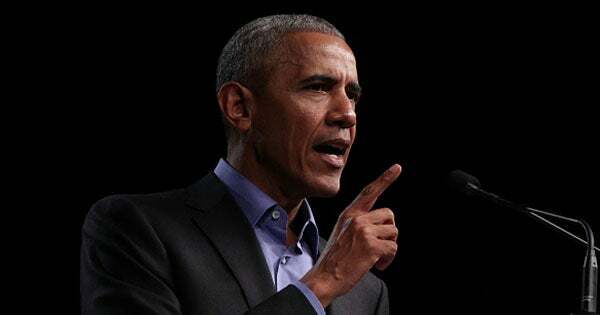 (laughing) Do you really expect us to believe that in this day and age that you can tell people Obama’s showing up, and you can tell people they can’t hear what he’s gonna say and then can’t report what he said when they hear it? These people are not idiots. This was the best way to promote this thing. Well, anyway, it is now leaking out what Obama said. And there wasn’t anything new in it. There wasn’t much earth-shattering. But I do want to play for you a sound bite from it. This, best I can tell, has not been reported, and it’s also not something Obama has not said before. He has said it before. The importance here is that I think this blurb, this sound bite from Obama, emphasizes something that I want you all to always remember. Does somebody…? What are we doing with the mix-minus in there? (interruption) That’s twice the Zephyr’s gone down. It’s coming back immediately? (interruption) All right. Okay. (interruption) So we’re on the third backup Zephyr now. What, do we got a DDoS going out there? That’s direct denial-of-service attack. At any rate, here’s the bite. They really believe… Tom Daschle has said this, any number of Democrats, but they don’t want to say this in public. And I’ll tell you why. They don’t want to say it in public because they’re at the point now where they don’t want to convey any degree of, what, importance on me. Their objective where I’m concerned is to treat me as a “been there, done that” has-been. But in their day-to-day existence, they are still cursing August 1st, 1988. Now, here’s how Obama addressed it at the super-secret MIT Sloan Sports Analytics Conference. This was Friday in Boston. OBAMA: Social media platforms are just that. They are a tool, and ISIS can use that tool, and neo-Nazis can use that tool. The large platforms — Google, the Facebook — uh, being the most obvious. They’re shaping our culture in powerful ways, and the most powerful way in which that culture is being shaped right now is the Balkanization of our public conversation. This was already happening with the advent of talk radio and cable. But essentially we now have entirely different realities that are being created with not just different opinions, but now different facts. RUSH: Let me translate this for you. That was… He dumps on Facebook and Google, and you throw Twitter in there. The problem is, they don’t control all those things. They found out… You know what enraged these people more than anything? When they found out Trump’s team outsmarted them in using Facebook. When they found out that Trump’s Neanderthal team was able to use Facebook and Facebook ads to reach far more people than the Democrats were reaching even though Google had a satellite office off of Obama’s Oval Office. Let me translate that for you: “This was already happening with the advent of Rush Limbaugh and Fox News.” He said, “Now we have entirely different realities being created within the just different opinions, but now different facts.” Obama is always whining about this, that we no longer have a single set of facts, meaning we no longer have the Drive-By Media news monopoly that we had prior to the 1988. They don’t like mentioning my name because they don’t want to shower me with any more attention than I already get. But it’s out there. And this is in the super-secret, nobody’s supposed hear about it, nobody’s supposed to talk about it, nobody’s supposed to report it kind of speech. Remember, this was at a sports conference. 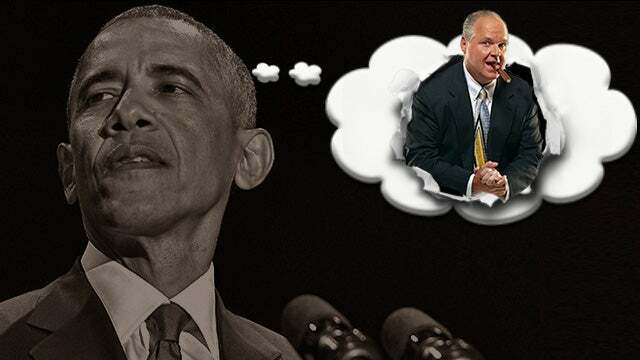 RUSH: Let’s finish up with Obama. Got one more sound bite here from Obama at the super-secret speech in Boston at the MIT Sloan Sports Analytics Conference. This was Friday. Here’s the second Obama sound bite. OBAMA: We have to have a serious conversation about what are the business models, the algorithms, the mechanisms whereby we can create more of a common conversation, and that cannot just be a commercially driven conversation. Capitalism works, marketplace works because there are some basic rules of the road in place that create level playing fields. All those things make the market work for everyone. RUSH: Well, let’s unpack this. I’m in the middle of a market. This program is smack-dab in the U.S. economy. This program started in 1988. There was no funding. There are no donors here. There’s no backing anywhere. There’s no government involvement whatsoever. This program began in pure, raw capitalism. And we were competing against everybody on the radio at 12 noon Eastern time. And we entered a marketplace where the conventional wisdom in broadcasting was that syndicated programming in the daytime never had a chance. The belief was, at the highest levels of broadcast wizardry, that daytime radio needed to be local. The issues discussed had to be local. The phone numbers that people called to be on the program had to be local numbers. Everybody about it had to be local. So nobody thought this program would work. Except I did. 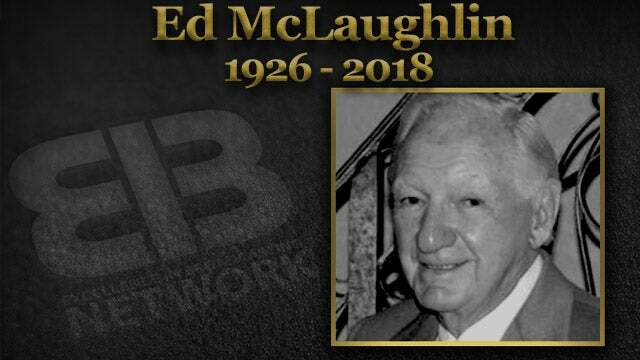 And so did Ed McLaughlin, who was the founder of the EIB Network, the late Ed McLaughlin. And we started with 56 stations and just the limited budget that Ed had to invest in the program. And it grew. And we established this program as the most listened to radio program in America right in the smack middle of capitalism. We didn’t have any assistance. Everything that’s happened on this program, we earned it. There hasn’t been a single grant. There hasn’t been any financial investment, support, what have you. Turns out it hasn’t been necessary because we earned it. So why are we disqualified? In Obama’s view, why is this program disqualified? Why is this program considered a troublemaker? Why is this program responsible for busting up the single set of facts that Americans got prior to 1988? If Obama said that once, he said it a hundred times. And he’s not the only leftist to talk about it. What that means is they had their news monopoly. They had a monopolized control over what you were told, what the news was, and what wasn’t reported, which is just as important as what is. And it was right in the middle of capitalism that this program entered the competitive fray and triumphed. Now, what’s Obama’s problem with it? If you listen to this sound bite, “We have to have a serious conversation about what are the business models, the algorithms, the mechanisms whereby we can create more of a common conversation.” What the hell does that mean? Well, what it means is, in Obama’s world, we have to find a way that we can eliminate the stuff that we don’t want to hear. We have to find a way we can eliminate Fox News. We have to find a way to eliminate talk radio, because it’s not what we want to hear. “We need a more common conversation.” Translated: We need to be the ones determining what people know, and that cannot be, he says, just a commercially driven conversation. “Capitalism works because there’s some basic rules of the road in place that create a level playing field.” Capitalism is not about creating a level playing field. That is purely a liberal construct. There’s no such thing as capitalism creating a level playing. Precisely because the playing field isn’t level in capitalism. That meritocracy is generally, usually the reason why capitalistic entities succeed and triumph. Level playing field? 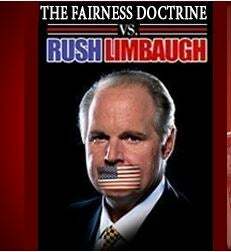 A level playing field is when some arbiter sits around and says, “It’s not fair that Limbaugh has that many stations. So we’re gonna take some of ’em away because the liberals can’t get on them.” That’s what a level playing field is. That’s the left wanting to control the market because they can’t win in it. And that’s what Obama’s talking about. This program and others like it, Fox News, are the epitome of capitalism. There was an established order. There was an established media order, an established journalism order, and all of a sudden some new entrants came into the scene and disrupted everything on the basis of what? The American consumer making a choice! The American consumer wasn’t fooled. The American consumer, you in this audience have not been hoodwinked or tricked. You haven’t been forced to abandon whatever you were listening to and then turn on this program. We earned that. And if we don’t earn it every day, we’ll lose it. I’ve described for you the cutthroat competition that exists in the tech world. I haven’t dwelled on it because it’s got some political overlay. But it is bloody. The degree of competition in the tech world is — it’s proper. It’s all legal. That’s the nature of the game. Imagine a level playing field. Samsung only sells in a year the number of iPhones Apple sells in a month. Well, that isn’t fair. So we need to somehow do what? We either need to penalize Apple or we need to somehow subsidize Samsung. Well, that’s what Obama’s talking about, and that, my friends, is not capitalism. So the way the competition works, Samsung or competitors of Apple will go out and make deals, arrangements with certain journalists to constantly bash Apple, and it’s up to the consumer reading this stuff to understand what’s legit and what isn’t. But that’s the nature of the game. Liberals do not like outcomes where they lose. Liberals are obsessed that they cannot dominate talk radio. It’s not that they can’t dominate it. They can’t even get to first base in talk radio, and it just ticks ’em off like you can’t believe. So they’re constantly whining and moaning. We no longer have one set of facts. So what’s Obama’s solution? It’ll be something along the lines of rebirthing the Fairness Doctrine, which Reagan eliminated in 1986, and they claim that’s what permitted this program to prosper and grow. And I’m telling you it had nothing to do with it. I was doing this same program in Sacramento starting in 1984 and ’85 and ’86. The Fairness Doctrine was in play and it didn’t affect one thing. They want to use the Fairness Doctrine in a way it was never intended. They want to turn it into the equal-time doctrine. So if I effectively bash liberals here, what they want is for a certain equal percentage of time in this program be devoted to promoting liberalism. That’s how they envision leveling the playing field. Well, fine, but that’s not capitalism. That is government control. And that’s what they’re talking about. I find it fascinating — and they’re doing the same thing in this NRA debate. They do the same thing at virtually everything where they are losing and not getting their way. Same strategy, same structure, same objectives, same way of speaking about the people they disagree with. Racist, sexist, bigot homophobe, white supremacist, Nazi, murderers and so forth. Whatever it is. Because they — in the free market — lose. In the unfettered, capitalistic free market, they lose. So Obama constantly does this. Tom Daschle… Snerdley, do you remember this? This was after the 2002 midterms, which I have discussed on this program on several occasions, the 2002 midterms where the Democrats did the Wellstone memorial and thought they were gonna win back a majority of seats in the House after George Bush won the presidency in 2000. And they ended up losing seats largely because of the Wellstone memorial. But Tom Daschle came out about six months after the midterms, so that’d be in March of 2003. RUSH: Okay. We’re starting on the phones in Cleveland. This is Patty. And welcome. It’s great to have you here today as our first caller. Hi. CALLER: Thank you, Rush. Thanks for having me. CALLER: I just wanted to call in and comment on your Obama story first off this morning about his non-recorded comments. You mentioned that your organization started and grew in 1988 without the support of organizations, and to me that’s why you’ve been so successful, is your comments and your stories are true, and they’re genuine, and the public can see that. And that is exactly why I voted for Trump. I knew he was coming out on his own talking about ideas for the country. He was not in it for fame or fortune. And I felt that he was genuine. And I think today that’s why he’s been so successful. CALLER: And he’s been successful, and he’s doing what he said he would do. And for the most part I think the country’s behind him. I’m sure there’s things that — I mean, there’s things I don’t totally agree with on everything, but he’s in it for the right reasons. RUSH: Well, that’s it. You trust it. CALLER: The age limit on the guns as well. I wonder if this is why he’s maybe backing off that a little bit, because he’s listening to the country, he sees what we want. And I haven’t seen that in a president in my lifetime. RUSH: I think Trump toys with ’em. Like the meeting he had, televised meeting on immigration where he told the Democrats, “Hey, you know what? I’ll sign whatever you send me. I can’t do this without you all.” He flushed them out. He made them tell the country everything they wanted to do. And then, of course, common sense said, don’t do that. He toys with ’em. I’m sure it’s the same thing here.